:Berlin, 1933: as Hitler rises to power, the law ? designed to protect and serve ?becomes twisted to the will of those who dream of a pure Aryan race. SS Officer Walter Gunther is intensely loyal to the Third Reich. His readiness to kill without question or remorse would seem to make him the ideal candidate to lead the T4 euthanasia programme. SS Officer Karl Muller, a trainee doctor and engineer, is also brought into the programme, and assured that his work is consistent with the Hippocratic oath he's due to take. Their mandate: to kill the ?unworthies? ? not just the Jews, but crippled children, the mentally ill, homosexuals. Hedda, Walter's wife and old acquaintance of Karl, has no idea of what their work entails. Until, that is, the fate of their families is at stake, and each must confront afresh the choices they have made. This dark, tense novel is a compelling story of human tragedy, and man's potential to revel in, or fight against, the evil actions of a corrupted nation. 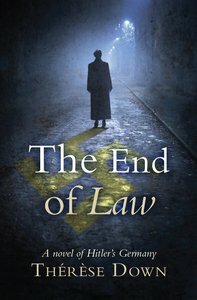 About "The End of Law"